Owen Mulligan has criticised both Sean Cavanagh and Tyrone coach Gavin Devlin for airing their dirty laundry in public. OWEN MULLIGAN SAYS his former team-mate Sean Cavanagh might have broken an unwritten rule by criticising Mickey Harte for the style of football they’re employing. 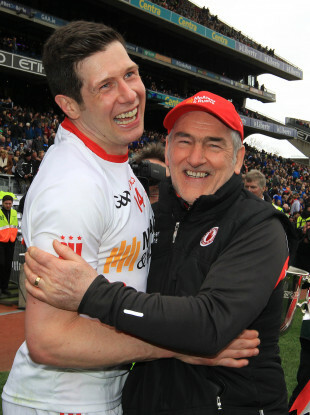 2017 skipper Cavanagh sparked an ugly war of words with the Tyrone boss and his assistant Gavin Devlin after he labelled Harte’s management style ‘autocratic’ and said his defensive structure stifled the development of several ‘marquee’ forwards in the county. Devlin fired back, declaring that Tyrone may have failed to lift the Sam Maguire in the last decade becase of ‘calibre of captaincy’ and questioned why he didn’t voice those opinions while he was still involved. After the Red Hand’s extra-time win over Meath on Saturday night, Harte responded to a question about Cavanagh’s comments by saying: “Some of the people that are spouting about that (defensive football) just seem to have an agenda which is negative and they just seem to be sad people who are negative all the time. “So maybe they should look in the mirror and brighten up a wee bit and look at the bright side of life,” he added. Mulligan waded into the debate and criticised both Devlin and Cavanagh for airing their dirty laundry in public. “Every player or past player has a right to his own opinions or views on different matters,” the Cookstown native told Paddy Power News. “I myself, in past interviews and blogs have criticised Micky Harte’s style of play. But it’s almost an unwritten rule among the old guard that you don’t come out and be disrespectful to ex-teammates and management, especially when fresh out of retirement and in the business end of the season. “Managers and players always disagree, and Harte was sometimes hard to approach as a player, but that’s what a captain’s role involves, thrashing out what’s best for the team and being a spokesperson for the players. Mulligan won three All-Irelands under Harte and soldiered alongside both Devlin and Cavanagh for years. “At the end of the day, if you poke the bear the bear is going to react. It’s worth remembering that Cavanagh has torn a couple of teams apart, he’s not exactly Mr. popular in Mayo either. Devlin is the type of man that’s going to come out swinging. “I really don’t think that Gavin Devlin should have come out and said what he did. Questioning Sean’s captaincy credentials was always going to cause a stir and make a bigger story of the whole thing. He added that Cavanagh’s comments are “are a bit of a contradiction” given his brother Colm his thriving under Harte’s system. “While the forwards he named suffered from Harte’s tactics, his own brother Colly has flourished in a role that Micky Harte has created especially for him, and has become the best sweeper in the country. Colly has also received an All-Star nomination and a full All-Star, all because of this role he plays. “So, instead of slating his ex-manager, he should be thanking him. I understand being a pundit and writing a book is all about promoting yourself, but you can stay loyal at the same time, especially when the man helped him win nearly every honour he has. “You have to remember as well that Colly is caught in the middle. One thing I noticed after the game at the weekend was that Colly wasn’t celebrating at all after the victory. Email “'Instead of slating his ex-manager, he should be thanking him' - Mugsy on Harte-Cavanagh war of words”. Feedback on “'Instead of slating his ex-manager, he should be thanking him' - Mugsy on Harte-Cavanagh war of words”.